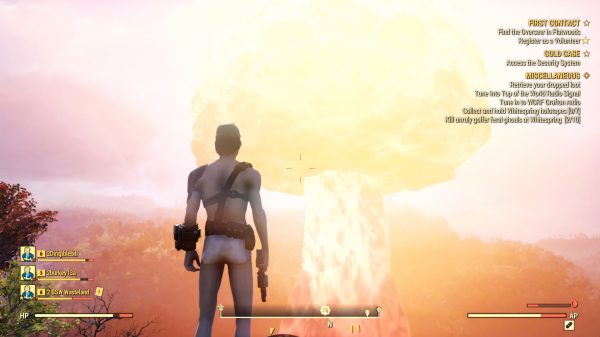 It’s about 30 minutes into my Fallout 76 session and I’m already in my pants. It’s what Bob would want. 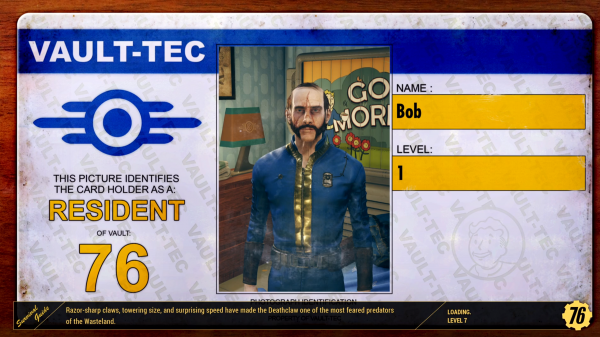 Bob is my wastelander, fresh out the vault. With bedraggled, balding hair, mutton chops, a horribly scarred face and the body weight of a large child, Bob stands out. Even more so when he’s wearing discoloured pants, a party hat, and some cobbled-together chest armour made out of belt straps. The machete in his hand helps, too. Meeting a surprising range of personalities has always been a part of Fallout’s charm – the quests often just a jumping off point to give players a glimpse into the lives of this cast of misfits, criminals, and survivors. Fallout 76 – a new multiplayer take on the post-apocalyptic RPG – doesn’t have any of this, however. Instead, it wants the players to become the characters. And so, for a glorious three hours, I became Bob. Some context: Bob is a knob. At one point, my team and I meet a high level Bethesda Game Studio employee decked out in power armour. They invite us into their house. Upon entering, I immediately pull up the emote wheel and throw up all over their carpet. When a teammate begins playing the tuba, I stand in front of them and squat along to the beat in my off-white undies. It looks even more majestic now Bob has swapped out his party hat for a dirty mining helmet. When Bob soaks up too much radiation, he mutates and becomes part marsupial. Appropriately, this knocks down his Intelligence stat by a few points. It also allows him to jump about seven feet into the air. 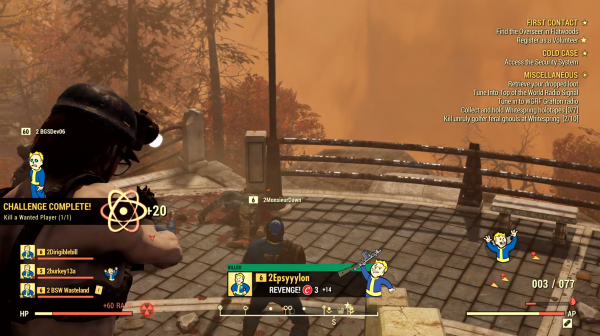 Bob is a majestic distraction from the huge, desolate, hostile wasteland of Fallout 76’s West Virginia. Official Xbox Magazine tell me Bob made their game footage unusable. Bob is the best. It’s easy to see what Bethesda is going for with Fallout 76’s lack of NPCs and dialogue options. But after just a few hours with the game, it’s hard to tell whether it will work as intended. 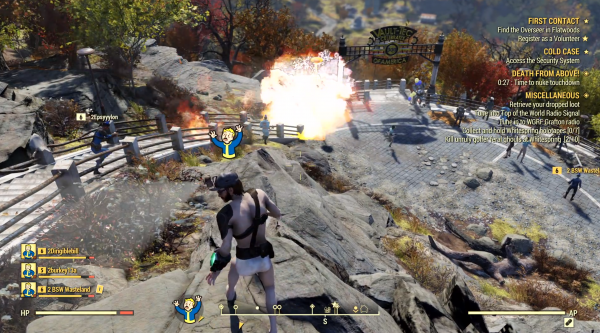 Roleplaying as a chem-addicted hillbilly, a mysterious lone wanderer, or anything in-between is a lot of fun, but leaving such a large part of the experience in the hands of the players is a risky move – nothing quite ruins your immersion more than a naked man squatting. Of course, you can play alone or block people who are annoying. Like I said, it’s all in the players’ hands. How each player moulds their experience will play a big role in how much enjoyment they get out of this multiplayer spinoff. You do need to talk to NPCs for some Fallout 76 quests, though. Well, I say you talk to them – they talk at you, then you get a quest marker and head off. They’re usually robots, on account of all the humans being dead. Other quests appear over the airwaves as you enter the radius of a radio signal. Others simply pop up as you enter a new area. You get a lot of quests – especially when you are running around the huge map trying to squeeze in as much as you possibly can. Because of the way the content is fed to you, and because there are so many distractions, it’s sometimes hard to know why you are doing things. You feel like you’re following markers, rather than a thread in an interesting story, which makes it feel fundamentally different from previous Fallout games. There are also some compromises to support this extra player count. For example, Bethesda Game Studios titles generally have a lot of interactive objects in the world that are physically simulated. There are far fewer in Fallout 76. You know how you can usually hold the interact button to pick an object up and manipulate it, whether it be a body or a tin can? That’s gone as well. The V.A.T.S. targeting system makes a return, but it feels weird to use in real-time and thus only feels useful as a way of spotting distant enemies. Dismemberment also seems to be scaled back, and the enemy AI is nowhere near as good as it was in Fallout 4, which saw packs of feral ghouls swarming, bundling through windows, or crawling out from under cars. The new enemy faction in Fallout 76 are the scorched – once human, these irradiated, weapon-wielding baddies tend to just hunker down behind cover and trade shots with you. Saying that, the simple AI does allow for some tactical play. Most enemies tend to run straight at you, which means you can lure them through bottlenecks or into minefields. During one section, I anger the friendly robots of the Greenbrier resort and end up battling hundreds of them. There’s no end to the metallic menaces and I’m forced to retreat. I’m around level five, and there’s a level 30 murderbot on my tail. My shots barely scratch it. I get it to follow me into a car park where its lasers ignite the nuclear core on a nearby vehicle, causing a huge explosion which takes it out. In another area, my team and I are attempting a high level public event. We’re fighting a level 50 scorchbeast – a flying enemy that’s somewhere between bat and dragon. We fire all our ammo at it and leave barely a mark on its massive health pool. At this point, one of the developers tells us that, if Bob hadn’t angered the robots of the Greenbrier, we could have lured it there and got the sentry bots to take it down for us. Classic Bob. With a map much larger than Fallout 4’s and only three hours to experience it, it’s difficult to give a definitive opinion on the game at this point. My team and I had a bunch of fun moments – killing a high level, power armour-wearing developer was one particular highlight – but it’s hard to say if it would have been just as fun playing with a server full of random people. Then there’s the fact that the ridiculous scale of the thing meant we only saw a tiny portion and spread ourselves thin across the glut of distactions, quests, and sights dotted around West Virginia. So much of the experience seems to be tied to the mid-to-end game content. Base building is massively important, as Fallout 76 allows you to pack up and plonk your base down anywhere on the map, but it requires lots of materials so we didn’t get a chance to have a proper look at that. Nukes also play a huge part, and we only saw one at the end of the session. We saw it going off, rather than the explorable aftermath, which spawns high level creatures and rare loot. There’s a wealth of potentially brilliant stuff to get stuck into, though, so I’m looking forward to wandering the wastes in my pants when the beta launches later this month.